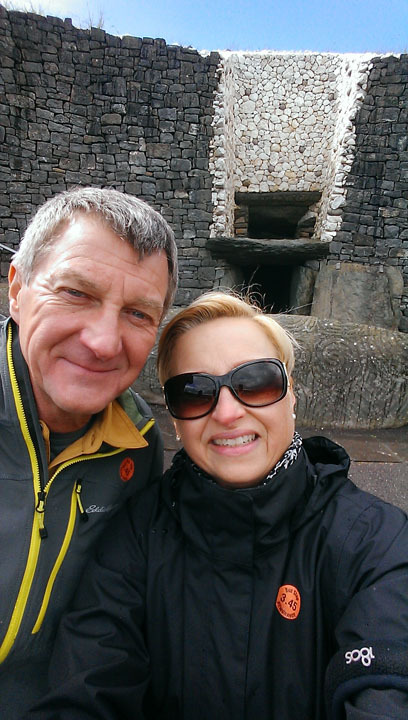 Louise and Michael visiting Ireland, standing in front of the ancient tomb at New Grange. It’s been awhile since I wrote a new post, but I’m back and ready to dig into our Genetti genealogy! For the past six weeks I’ve been adventuring in Ireland with my husband, Michael. We had a grand time hiking through the Irish countryside, chatting it up with new-found friends, exploring ancient ruins, and generally “having craic” (pronounced ‘crack’) – the Irish expression for having a good time. Since part of my husband’s lineage is Irish, we also conducted a bit of informal genealogy research on the Roach surname (originally spelled Roche) wherever we wandered. During conversations with local people we met, tour guides or museum historians, I always mentioned the Roach name. Everyone recognized it as a prominent Irish surname originating in County Cork, but I learned very little beyond this. Deciding to take matters into my own hands, one evening I searched Google for ancestral leads. Prior to our trip, my husband had conducted his own family research on Ancestry.com. Michael was confident of his American lineage stretching back to the late 1790’s. But he found no ancestor that linked his 3rd great-grandfather, John Jacob Roach born in 1802 in New Jersey, back to Ireland. In genealogy research, this is called “a brick wall”. Unfortunately for Irish descendants, it is a common problem since many records were destroyed during numerous uprisings throughout Irish history. And later, records of Irish immigrants were burned during the American War of 1812. Luckily my research skills quickly paid off! I came across a goldmine of genealogy information about the Roche/Roach/Roache clan in a blog published by Jim Roache called Roche Lineages. Michael’s ancestral roots were indeed planted in County Cork, with the arrival of two brothers to the island in the year 1167. The brothers had been knighted and granted land in Cork. I soon found another surprise – the Roche family was actually Flemish. (According to Wikipedia, the Flemish were a Germanic ethnic group who spoke Dutch and lived in the northern region of modern-day Belgium.) The family first settled in Wales over a thousand years ago before moving on to Ireland. According to Jim’s findings, they were not Irish in origin but transplants that came with the Norman invasion of Ireland in 1172 – a true surprise! To learn if Michael is connected to the original Roche family from County Cork, he’ll need to take a Y-chromosome DNA test and enter it into the “Roach, Roche, Roch Surname Group“. This surname project was established by Peter Roche through Family Tree DNA to collect Y-chromosome results from males having the last name of Roach or any of its similar spellings. Positive DNA matches with existing members in the group will link Michael to a specific branch of the family and perhaps connect him with distant cousins throughout the world. Very exciting indeed! Jim Roache’s blog contained a good deal more information in the form of an ancestral timeline. He had compiled info on every person, event and date he could find belonging to the Roach family of Country Cork and published it all in one large PDF document. Impressive! I was intrigued by this genealogical presentation. The thought occurred to me that a similar timeline might work for the Genetti family. Over the years I have accumulated a vast amount of ancestral information on our family, including births, marriages, deaths, news articles and other interesting tidbits. How to organize and assemble all of these facts into one easy-to-read, searchable document had been a problem. Perhaps a timeline was the right solution! By compiling statistics from the original records of Castelfondo, Trentino (our ancestral village) along with our modern family stats, a document could be created that consolidated all information from every branch of the family in one place. Plus by using a digital format for the Timeline, new information would be easy to add and publish as future revised issues. So you guessed it – this will be my next family project! My vision is to establish a Genetti Family Timeline as a concise archive to be enjoyed by today’s family members and for use by future generations in their own genealogy research. It will be a document that can be passed down from one generation to the next. A tall order to tackle, but my genealogist heart is doing back- flips! Yes, this is a project that I can really dig into and continue to develop! I’ll keep you posted as to the progress of our Genetti Family Timeline. Before I close … a big thank you to all the great folks who emailed me while I was traveling. I’ll be getting back to you as soon as I can to compare notes, share DNA test results and chat about our family connections. I may even share your messages here at our blog. Thanks so much for taking the time to visit and participate in The Genetti Family Genealogy Project! It’s fun following your travels and genealogy project. Thanks for reading my posts Kathe! Love seeing photos of your travels too!